Instructor Tom Patri in this week's SI Golf Plus can't understand what's taking Phil so long to blame his post U.S. Open inconsistency on his buddy/teacher and actually makes some great points. First, I can't fathom why Smith, who's worked with Mickelson for a decade, has never shortened Mickelson's swing, which is sometimes as long and loose as John Daly's and routinely causes Mickelson to hit wildly off-line drives and long-iron shots. Second, Smith and Mickelson just seem too close. They are not only good friends but also partners in business ventures, and their families are close as well. Such a deep friendship is almost always the kiss of death to a teacher-player relationship because it prevents the instructor from being sufficiently blunt and critical. The third-and biggest-problem is Smith's personality. He's simply too nice, which I think has caused him to be more or less a yes-man to Mickelson. Phil seems to be surrounded by people who too often have told him whatever he wants to hear rather than what he should hear. 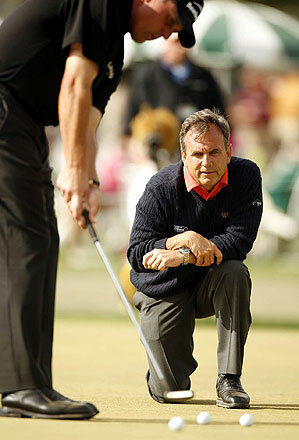 For that reason alone Mickelson dearly needs Harmon, who is an authority figure in the mold of Bob Knight.